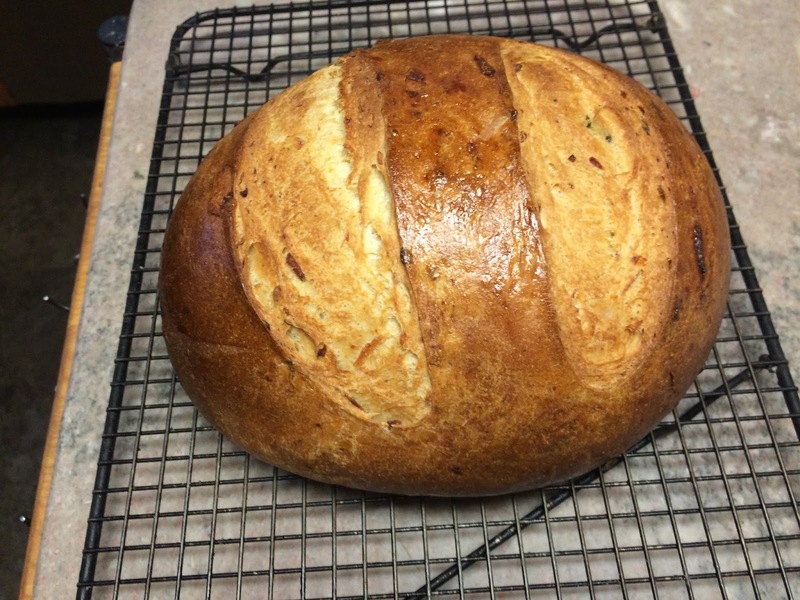 Breads From Betsy's Kitchen is the source of this recipe. Betsy Oppenneer, a bread baker, author and baking instructor, offers these comments to describe her Parmesan Potato Bread . . . It's hard to stop nibbling this exquisite bread. The crust is crisp and the bits of potato are slightly crunch. I love to eat the crust first, then start dipping the soft, sweet insides into a favorite soup...it's heaven! For a slightly marled texture, use shredded Parmesan rather than finely grated." Recipe from Betsy Oppenneer; I made a couple of changes as noted by the comments in (). 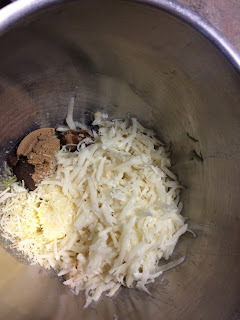 Add salt, garlic, rosemary, olive oil, potato, cheese, and 3 cups flour. Beat vigorously for 2 minutes. 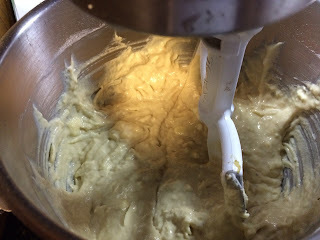 Gradually add flour, 1/4 cup at a time, until the dough begins to pull away from the side of the bowl. Turn dough onto a floured work surface.Knead, adding flour a little at a time, until you have a smooth, elastic dough. 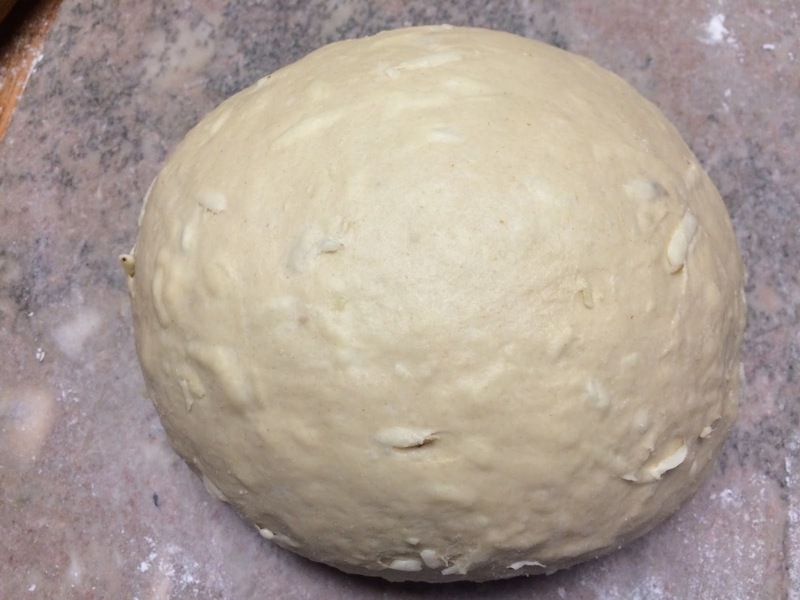 Place dough into an oiled bowl. 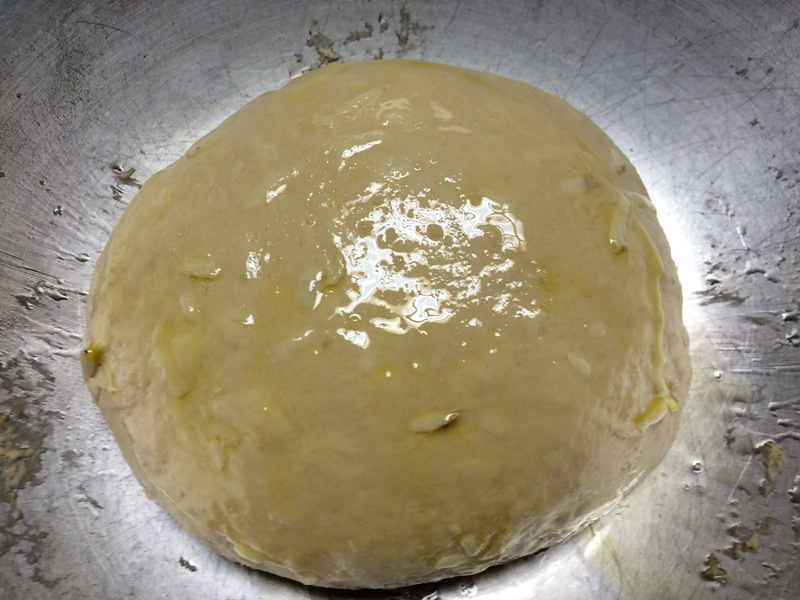 Turn to coat the entire ball of dough with oil. Cover with a tightly woven towel and let rise until doubled, about 1 hour. About 10 minutes before baking, preheat oven to 375 F. Place a shallow pan on the bottom shelf of the oven. 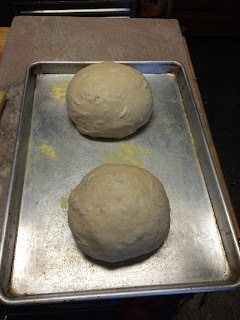 Place the bread in the oven and put 5 ice cubes into the pan on the bottom shelf. Close the door quickly to prevent steam from escaping. Bake for 25 minutes, or until the internal temperature of the loaves reaches 190 F.
Immediately remove bread from baking sheet and cool on a rack. * Baker's Lame — A Lame (pronounced LAHM, meaning “blade” in French) is typically a long thin stick made to hold a metal razor used to cut, or score, bread dough to help control the expansion of the loaf as it bakes. 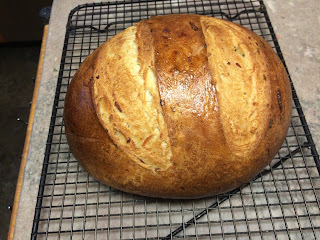 Parmesan Potato Bread   Yield: 2 round loaves  Recipe from Betsy Oppenneer; I made a couple of changes as noted by the comments in (). Mark -- Love your mom's bread cookbook. It is full of great recipes that I've made over the years. I am impressed with all of her accomplishments; she sounds like I woman that I would have liked to know. The fruits of her labors continue to inspire! Lime Cilantro Rice -- a refreshing side dish! Tomato Pesto Hummus -- with secret ingredient!